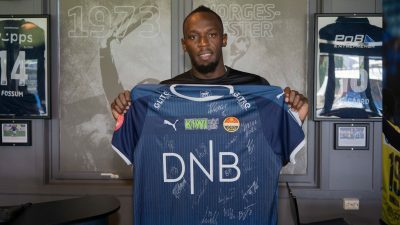 It created a bit of a sensation when the world’s fastest man, Usain Bolt, showed up in the mid-sized Norwegian city of Drammen this week, to train with the local football club Strømsgodset. He insists he’s just there to “get fit” again and “train with the guys,” and maybe learn a thing or two. Norwegian Broadcasting (NRK) reported that Bolt and Strømsgodset share a sponsor, so it made sense for them to all get some publicity when Bolt needed some football training before playing in a charity match at Old Trafford in Manchester next weekend. He’s also invited to play in a friendly match in Paris a few days later. Bolt will be in Drammen for the whole week, and was back out on the field Thursday after creating a media sensation on Wednesday. Strømsgodset had sent out a press release that the sprinter who’s won eight Olympic gold medals and 11 World Championships would train with the club for seven days. Reporters and photographers from nearly all Norwegian media rushed to the scene. Strømsgodset seemed delighted to have him on the field. The club reported that Bolt landed in Oslo Tuesday night and headed straight for the hotel in Drammen where he’s staying for a week. Strømsgodset officials reported that he arrived in Norway along with his manager Ricky Simms and the chief executive of sportswear company Puma, the former Strømsgodset Bjørn Gulden.